Draft: 2010, Baltimore Orioles, 24th rd. In 2015 was a mid-season Southern League All-Star and SL Pitcher of the Week for 6/23-6/29...in 2010 was a New York-Penn League All-Star in his first professional season...attended Georgetown University. Was 1 of 12 Reds players and 10 pitchers to make his Major League debut and 1 of a club-record 32 pitchers overall...beginning 8/16 made 9 consecutive starts while finishing the season in the Reds' starting rotation (3-3, 4.11)...from 5/20-8/1 was disabled with a strained left oblique...began the season at Louisville, where in 3 starts he went 2-0, 4.24 before he was promoted on 5/1, when RHP Raisel Iglesias was disabled...from 5/1-5/19 went 1-1, 3.72 in his first 4 Major League starts...in the fourth inning of that final start, on 5/19 vs Cle, left the game with the left oblique injury suffered on a pitch to Chris Gimenez...was disabled the next day...from 7/4-8/1 made 6 rehabilitation starts, 1 for the AZL Reds and then 5 straight for Louisville (1-1, 2.45)...on 8/2 was returned from the rehab assignment, reinstated from the DL and optioned to Louisville, where he made 2 more starts before he was promoted again on 8/16 to take Cody Reed's spot in the rotation...in his Major League debut, on 5/1 at PNC Park started the 11-inning, 6-5 win vs the Pirates in place of injured RHP Raisel Iglesias...left with a 3-1 lead but was charged with another run scored off Tony Cingrani...became the victim of a blown save when pinch hitter Matt Joyce's RBI-single off Caleb Cotham tied it at 3-3...the Reds won it in the 11th when Scott Schebler's RBI-double snapped the 5-5 tie...in the 5-1 win on 5/6 vs Mil combined with Tony Cingrani to become the first set of Reds pitchers to record a first career win and first career save in the same game since Joe Valentine saved Luke Hudson's 2-0 win on 8/20/04 at Ari...in the fourth inning of the 9-2 win on 8/19 vs LAD produced his first career hit and RBI, a 2-run double off Bud Norris that extended the Reds' lead to 5-0...was a non-roster invitee to Major League spring training camp, his first, and in 1 start and 3 relief apps in Goodyear went 0-1, 22.85 (4.1ip, 17h, 14r, 11er, 1bb, 4k, 1hr)...was reassigned to minor league camp on 3/18. Spent the season at Class AA Pensacola, where he was a mid-season Southern League All-Star...ranked among the SL leaders in ERA (3rd), wins (8th), starts (T4th), innings pitched (6th), WHIP (1.22, 3rd) and fewest baserunners per 9 innings for starters (11.11, 4th)...led the Blue Wahoos staff in wins, ERA, starts, innings pitched and strikeouts...among all Reds farmhands ranked fourth in ERA and T5th in wins...was named SL Pitcher of the Week after throwing 8.0 shutout innings (4h, 1bb, 5k, 101 pitches) in a 1-0 win at Mississippi on 6/27...the first week of August spent time on the disabled list with tendinitis in his right elbow...for the Reds in March made 1 relief appearance (1ip) in an exhibition game...on 12/18 was invited to 2016 Major League spring training camp, his first. 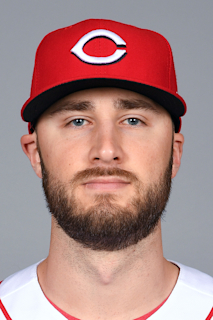 March 22, 2019 Cincinnati Reds released RHP Tim Adleman. February 23, 2019 RHP Tim Adleman assigned to Cincinnati Reds. December 6, 2017 Cincinnati Reds released RHP Tim Adleman. April 16, 2017 Cincinnati Reds recalled RHP Tim Adleman from Louisville Bats. March 29, 2017 Cincinnati Reds optioned RHP Tim Adleman to Louisville Bats. August 16, 2016 Cincinnati Reds recalled Tim Adleman from Louisville Bats. August 2, 2016 Cincinnati Reds optioned RHP Tim Adleman to Louisville Bats. August 2, 2016 Cincinnati Reds activated RHP Tim Adleman from the 15-day disabled list. July 9, 2016 Cincinnati Reds sent RHP Tim Adleman on a rehab assignment to Louisville Bats. July 4, 2016 Cincinnati Reds sent RHP Tim Adleman on a rehab assignment to AZL Reds. May 20, 2016 Tim Adleman roster status changed by Cincinnati Reds. May 1, 2016 Cincinnati Reds selected the contract of RHP Tim Adleman from Louisville Bats. April 6, 2016 RHP Tim Adleman assigned to Louisville Bats from Pensacola Blue Wahoos. December 18, 2015 Cincinnati Reds invited non-roster RHP Timothy Adleman to spring training. August 9, 2015 Pensacola Blue Wahoos activated RHP Tim Adleman from the 7-day disabled list. July 30, 2015 Pensacola Blue Wahoos placed RHP Timothy Adleman on the 7-day disabled list. March 12, 2015 RHP Timothy Adleman assigned to Cincinnati Reds. July 18, 2014 RHP Timothy Adleman assigned to Pensacola Blue Wahoos from Louisville Bats. July 14, 2014 RHP Timothy Adleman assigned to Louisville Bats from Pensacola Blue Wahoos. June 24, 2014 RHP Timothy Adleman assigned to Pensacola Blue Wahoos from Bakersfield Blaze. June 4, 2014 RHP Timothy Adleman assigned to Bakersfield Blaze from Pensacola Blue Wahoos. April 12, 2014 RHP Timothy Adleman assigned to Pensacola Blue Wahoos from Bakersfield Blaze. April 3, 2014 RHP Timothy Adleman assigned to Bakersfield Blaze from Pensacola Blue Wahoos. March 25, 2014 RHP Timothy Adleman assigned to Cincinnati Reds. October 14, 2013 Cincinnati Reds signed free agent RHP Timothy Adleman to a minor league contract. October 14, 2013 RHP Timothy Adleman assigned to Pensacola Blue Wahoos. March 27, 2012 Delmarva Shorebirds released RHP Timothy Adleman. June 14, 2011 RHP Timothy Adleman assigned to Delmarva Shorebirds from Aberdeen IronBirds. June 11, 2011 RHP Timothy Adleman assigned to Aberdeen IronBirds from Delmarva Shorebirds. April 7, 2011 Timothy Adleman assigned to Delmarva Shorebirds from Aberdeen IronBirds. June 17, 2010 Timothy Adleman assigned to Aberdeen IronBirds from Baltimore Orioles. June 16, 2010 Baltimore Orioles signed RHP Timothy Adleman.